The Creditors’ Rights Section was founded in 1992 to meet the needs of attorneys whose practice is concentrated in the representation of creditors. It addresses the educational, economic and legislative needs of its members. Membership in the Creditors’ Rights Section is supplemental to membership in the Commercial Law League of America. Members of the Creditors’ Rights Section are professionals engaged in the practice of creditors’ rights law who also serve the credit industry in other commercial legal matters. The goals of the Section are to promote high standards of professionalism, integrity and excellence, to facilitate the exchange of ideas, and to address pending legislation (both state and federal). Its membership exceeds 700 and has quickly gained a reputation as a provider of quality education featuring some of the leading authorities in the country. It seeks out the authors of important works dealing with various aspects of commercial law. 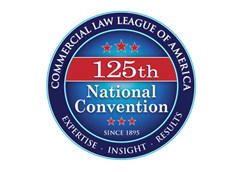 The Section monitors federal and state legislation impacting the commercial lawyer. It also developed a comprehensive guide to commercial collections that includes more than two dozen monographs on how to organize and manage a collection practice. Included are tips on marketing as well as a summary of substantive law that is crucial for the successful creditors’ rights attorney. Who Are The Members of the Creditors’ Rights Section? Members of the CLLA who are attorneys, judges, law professors, law students or editors of a law review are eligible for membership in the CRS. Any non-attorney member of the League who is employed in a law office engaged in debt collection or insolvency as an administrator, collector, paralegal or manager of a collection department is also eligible to join as an associate member of the Section. The CRS welcomes new members of the CLLA and bankruptcy practitioners to join and become active participants in the Creditors’ Right Section. If you have any questions regarding membership within the Creditors’ Rights Section please contact us at info@clla.org.